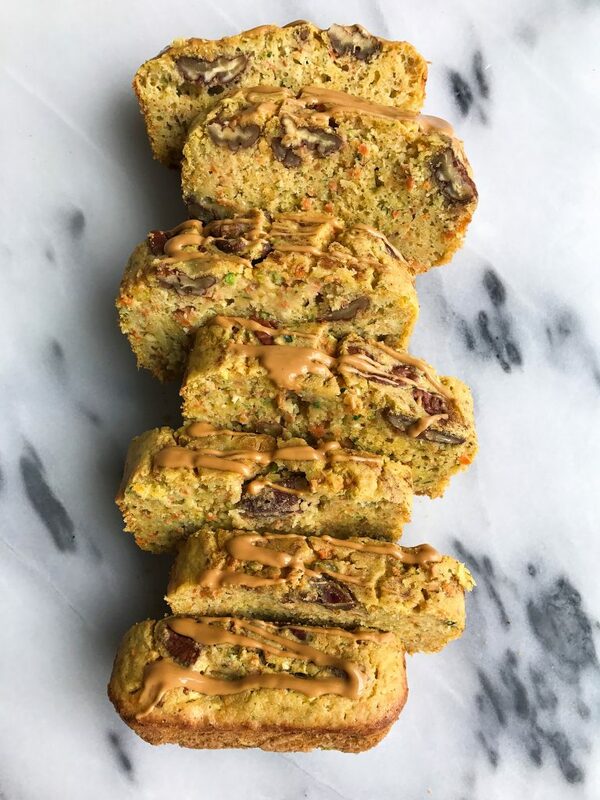 Chickpea Flour Carrot Zucchini Bread for an easy and delicious low sugar breakfast bread! 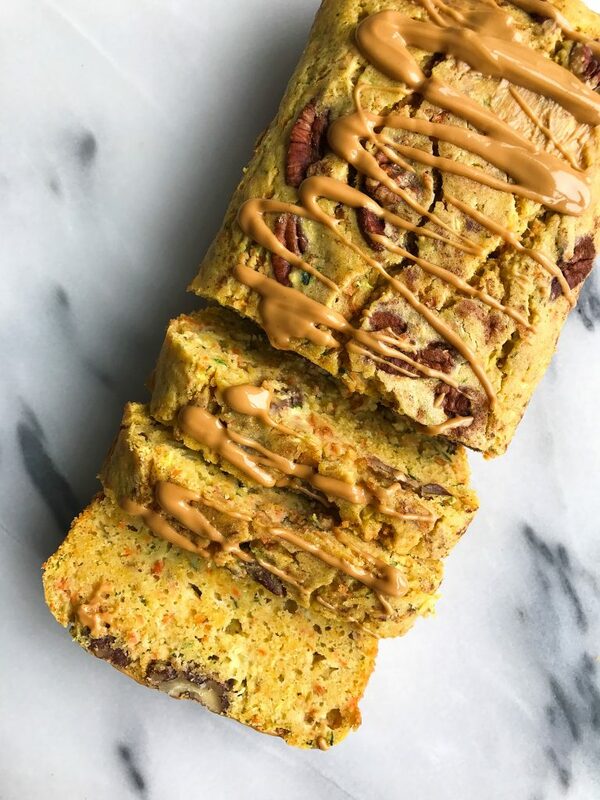 Chickpea Flour Carrot Zucchini Bread is HERE. I am a little late to the chickpea flour game but I am officially obsessed. And incase you are wondering, he had no idea it was made out of chickpea flour.. I am always looking for gluten-free alternatives for baking especially since I do try to eat a gluten-free diet now (helps to balance hormones I hear..). Chickpea flour is full of plant-based protein, it has a solid fiber content and it is so versatile. I used Nuts.com’s Chickpea Flour. It is made from dried chickpeas and it is an easy sub for any wheat flour or all-purpose flour, plus it has more fiber, iron and protein than others. It’s a sublet flavor that isn’t too overpowering either. 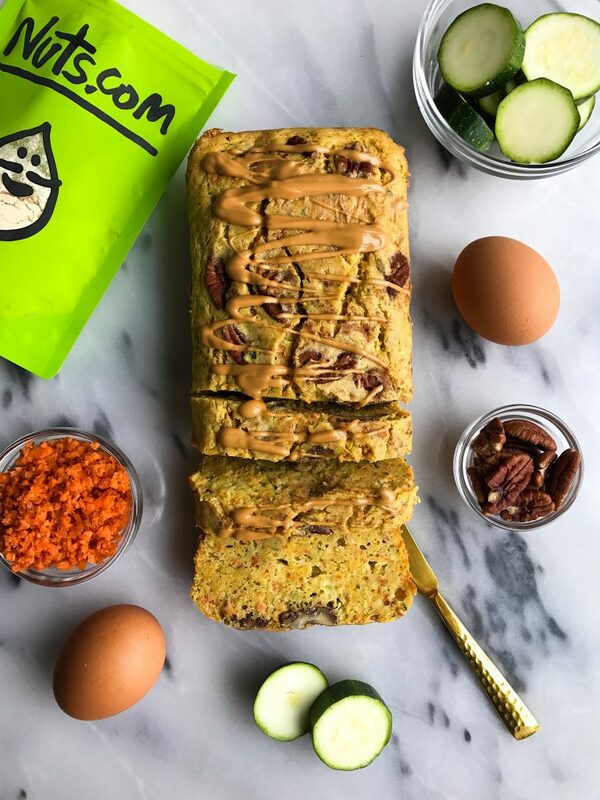 This Chickpea Flour Carrot Zucchini Bread is the perfect breakfast or snack loaf that isn’t too sweet and it is gluten and dairy-free. It is low in sugar with only a little maple syrup to sweeten the loaf and there are two types of veggies involved. I also added some pecans from Nuts.com on top for an extra crunch and a little nut butter drizzle, cuz duh. Nuts.com is game changer brand. They sell pretty much anything you can ever imagine in the nights, dried fruit and flour world (and more). And they deliver SO FAST. I ordered a bunch of different nuts one night and they were at my apartment the next day. It was insane. I highly recommend giving chickpea flour a try with this recipe. Add a little yogurt or nut butter on top and you will fall in love. Thank you Nuts.com for sponsoring this post. It means so much to me to work with brands that I love and who support rachLmansfield! I love baking with chickpea flour! Adds a new density element that i cant get enough of. This looks delicious! I love dense sweet breads, but I’ve never seen chickpea flour sold anywhere yet; once I do, I should get some. Often chickpea flour is referred to as gram flour. In uk can buy from Tesco in world food section. These sound incredible! Gorgeous pics too . . . This is a great bread. This looks delicious! Love how healthy it is. I’m still fairly new to chickpea flour, but am wanting to try using it more. I like to try new things! Hi, I just heard that coconut oil is no longer considered healthy for you. I would like to know what your opinion on it is because I love cooking/baking with it. Can I substitute almond or oat flour for the chickpea flour? haven’t tested but definitely let me know if you do! hey did u ever end up subbing almond flour? Zucchini is technically a fruit 🙈. Totally. I just learned that zucchini is a fruit. Mind blown! Hi! Do you think Bobs Red Mill gluten free all purpose baking flour would work for this recipe or do you think 100% chickpea flour is necessary? Celina – did you try this recipe wtih gluten-free flour? That’s what I was thinking I’d use when I make it this weekend. Hi, I’m just seeing this but I did end up using the bob’s Red mill gluten free flour and it turned out great! Hello. Was this baked in a regular sized loaf pan? Hey Rach, I was wondering if i can sub the coconut oil for anything else. Its the only ingredient I dont have on hand. Thanks! Is this recipe missing the salt in the ingredients? I just made this and I think it could really use some next time. This is my first time cooking with ALL chickpea flour (instead of in a blend) and I like it… I think I probably shouldn’t have squeezed the life out of the zucchini, too. Great recipe, will definitely make it again with my own tweaks! This is my new favorite zucchini bread. Made it a few months ago, and have been craving it, so I’m back for more! I drizzle almond butter on mine! Yum.